The Zimbabwe military has received rare praise from a shadowy Investigative group Pachedu of its rescue mission in the Cyclone Ida hit Manicaland province. The current official death toll is at 98. Shadowy Investigative group Pachedu said, "This is the military that we all deserve. We salute you ZDF for the patriotic service albeit our misgivings. To forgive we can, but it is hard to forget. Let us join hands in mitigating the impact of the cyclone. Thank you Zimbabwe Defense Forces." This is the military that we all deserve. We salute you ZDF for the patriotic service albeit our misgivings. To forgive we can, but it is hard to forget. Let us join hands in mitigating the impact of the cyclone. Thank you Zimbabwe Defense Forces. Hundreds of high school boys were evacuated by helicopter from a school buried by a mudslide. Survivors will be transported to Harare for medical checks and support. Two people, including a student, died in the landslide at St Charles Luwanga Seminary School. 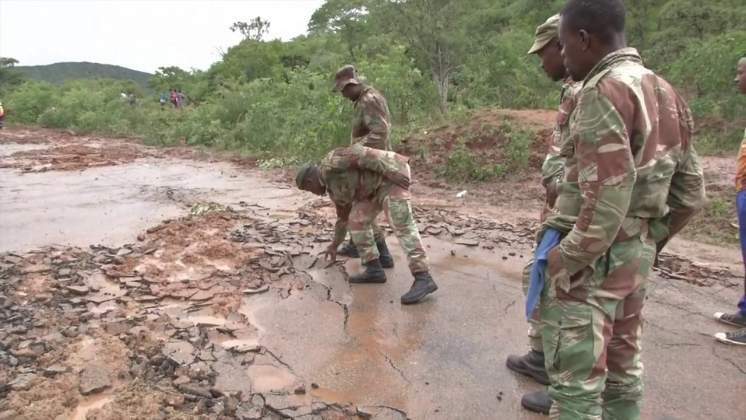 Zimbabwe National Army engineers have managed to create a detour along the Mutare-Chipinge highway to enable aid to pass and get to the victims. President Emmerson Mnangagwa returned home from the United Arab Emirates on Monday morning "to make sure he is involved directly with the national response by way of relief to victims of Cyclone Idai", the information ministry said.